As once-mighty social news site Digg makes major overhauls, cuts expenses, and reaches out to the users to fix the site, one has to wonder: is it too little, too late? users, making an effort to get feedback and (for once) acting upon it. startup path to claw their way back up. They won’t get there. Not like this. Not without help. their last chance to regain their position as one of the most important social media sites on the Internet. I stalled. When Reuters wants a quote, one shouldn’t stall, but I did. Should I speak from my gut, which told me that Digg was in trouble, or from my heart which has been hopeful that new leadership will guide the site back to prominence? The quote was sent just before her deadline on a Thursday. She thanked me and said the story was running Sunday. I never saw it. I checked again the following Sunday. Nothing. When I pinged her, she informed me that the story was cut. The tech editor had decided that the topic simply wasn’t important enough to cover anymore. To Reuters, which once highlighted Digg as a major influence on the Internet and even featured a section to help readers know what it was, Digg no longer held enough clout to warrant a story. No big deal, right? It’s Reuters, afterall. Stuffy mainstream media doesn’t get social media, so their opinion is irrelevant. Major tech blogs – that’s where Digg is buzzing, right? Look at Mashable’s coverage of Digg over the months. There was a time when the blog that many consider in touch with the pulse of social media would cover when Kevin Rose sneezed. Pete Cashmore himself even wrote a post on CNN defending the Digg V4 changes. Now, it’s barren. Since the beginning of October, there have been 11 mentions of Digg on Mashable (compared to 11 on any given day about Facebook and Twitter). Two of the mentions shouldn’t count because they were actually stories about Digg competitor Reddit. There were two stories about the bury button, two about staff cuts, and two about new CEO Matt Williams. One was about the recent overhaul, one was about former CEO Jay Adelson, and one declared Digg as one of the biggest flops of 2010. If Digg is unwilling to accept help and start generating real buzz about the company, it will soon be too late. May is the real deadline from a buzz perspective. While students are still in school and preparing for the summer, Digg must become a “top of mind” destination that people are checking on their iPads from wherever they go. They must be sharing Digg stories on Facebook and Twitter. If Digg goes into the summer with the buzz level they currently have (none), they will miss a major window (perhaps their last) to get mainstream pickup and viral spread. Digg V4 marked a transition towards granting power and giving the front page over to mainstream media. The goal was to get the endorsement and support of high-traffic sites like Mashable and Engadget as well as tastemakers in the tech world such as Leo Laporte and Gary Vaynerchuk. The users hated the change. They revolted. 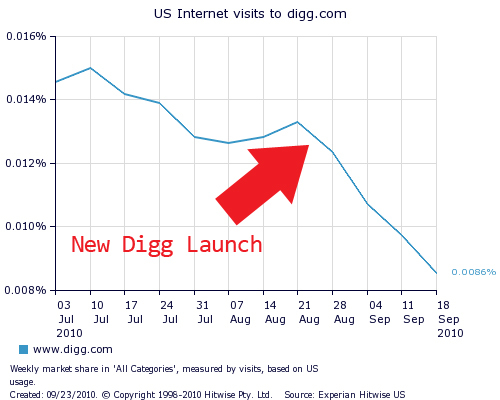 Digg started losing traffic and respect like a stock market crash. To compensate, Digg has made dramatic changes to both the promotion algorithm as well as the way that users find stories. Then, the spam hit. More changes, more tweaks, and finally things seem to have settled down. The latest version of the Digg algorithm is so paranoid, so guarded that the front page will often go hours without an update. In V3, it was not uncommon to see 100-120 stories promoted every day. A look at the current front page as of the time of this article shows 15 stories promoted in the last 10 hours. Digg initiated a Staff Picks section that helped them to highlight stories that otherwise would never get traction. This was a good idea in theory, but the lack of imagination of the staff doing the picking has made it relatively worthless. Judging by the sources, it would appear that the staff is using the default newsfeed bookmark on IE6, promoting Telegraph, DailyMail, and Time magazine rather than actually finding unique quality content. Digg will never be relevant while promoting sites that don’t care about Digg and stories that Digg users don’t care about. 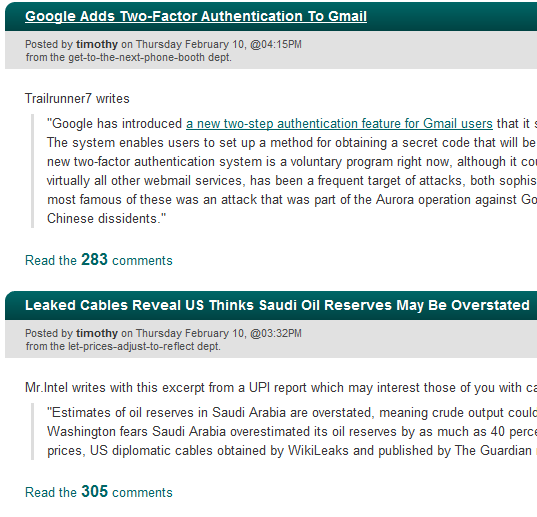 Why do people flock to similar sites like Reddit, Hacker News, Fark, and Slashdot? Is it the content? Sometimes, but only as a starting point. The communities at each are fueled by small pockets of users who make the comments on popular stories often more entertaining than the content itself. The key to new adoption is sharing on Facebook and Twitter. It is on those sites that discovery happens, that new people find these old sites for the first time, and where active users are born. There is no reason to share a story from Digg. The discussion is minimal compared to the competitors mentioned above. It isn’t uncommon to see hundreds of comments about a single piece of content with clever and thoughtful dialogue sprinked in to make them worth reading. Digg doesn’t have that. Unfortunately, it’s a catch-22 for them as they need interesting discussions to make the discussions more interesting, a task that cannot be achieved organically in time to make a difference. 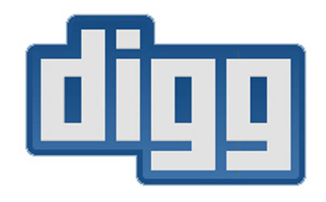 Clear and decisive action must be taken for Digg to make it. That’s all there is to it. The traffic remains at its lowest levels in years. Outbound traffic is equally suffering – the fabled “Digg Effect” that has crashed hundreds of servers over the years is gone. While Reddit regularly sends over 200,000 views to single pieces of content, Digg’s top stories rarely (if ever) break 50,000. UI changes and user-feedback cannot save Digg. In the next 3 months, three things have to happen for Digg to survive. These are drastic suggestions. These are drastic times for the beleaguered site. Generate Buzz: Digg desperately needs a PR firm, social media strategy firm, or even an internal team to get positive press posted about them everywhere they can. This was suggested and subsequently ignored in the past. As a result, nobody’s discussing the former darling of social media. Return to Discovery: There are better feedreaders out there for people wanting to read the NY Times or USA Today. If Digg continues to reward mainstream media and keep the algorithm so tight that the front page moves at a snail’s pace, they give new (and old) visitors no reason to care. Show us something we didn’t see on CNN this morning. Manufacture Discussion: Most would be shocked to learn that some of Digg’s competitors actually pay people to generate interesting, witty, and intellectual comments. It’s not discussed in many circles but nobody really worries – if it makes us laugh, smile, or think, who cares if it’s “artificial.” People will not share Digg links on Facebook or Twitter without a reason – they’ll share the content source. Give them a reason to point their friends towards a Digg.com page. These suggestions are ugly. They represent everything that is bad about social media – artificial, inorganic, spammy measures to make a site seem more interesting than it really is. Unfortunately for Digg, they are the options that are left on the table. As ugly as they are, there is one good thing about them. They would work.